Today, Good Afternoon, This Week, Something to Say, Documentaries – including And on the Eighth Day, Black Man’s Burden, The Day Before Yesterday, Dowager in Hot Pants, Dickens: The Hero of My Life, A Far Better Place, The First Casualty, Hard Times, The Hardest Way Up, Harry’s Out!, The Making of a Saint, Munich: The Road of Excess, Queen of Hearts, Till I End My Song, The Second World War, We Was All One, A World of Their Own. Jeremy Isaacs, Thames Television’s Controller of Feature Programmes, was this year awarded the Society of Film and Television Arts’ Desmond Davis Award for his “outstanding creative contribution to television”. A former President of the Oxford Union, his senior programme appointments in ITV and BBC have included the editorship of Panorama and production of This Week. He joined Thames on its formation in 1968. When I was asked to write for a series of advertisements on Thames Television’s programme departments I didn’t want to do it. I gave three reasons: the only good advertisements for television programmes are the programmes themselves; most campaigns advertising television companies are designed not to draw attention to their good stuff but to distract it from the rest; and all advertisements like this are sitting targets for the satirist. On the other hand, I recognise that many of the people most interested in the future of television see very little of it. If advertisements succeed in telling them about the programmes we make, there is something to be said for them. So here goes. What I want to do most is give people the information they need about what is going on in this country and the world. I aim at a mass audience, but a far more sophisticated audience than we used to think. So we make a wide range of programmes and Thames has the biggest current affairs department in ITV. This Week, reporting national and international affairs, looks like having (crossing my fingers hard) one of its best years yet under John Edwards. The Timothy Davey interview, for example, was a remarkable news scoop, Today, our daily London local programme, had a rougher than usual start when we began it. But now it’s seen in more homes than both London evening newspapers put together. It tries to combine hard reporting of London’s problems with live discussions of national issues. And it makes people laugh too. Good Afternoon, which used to be called Tea Break, is still a beginner: a magazine for people at home during the day, not aimed at women as a weird separate species, even though it’s presented by women and produced by one. We’re still working to get it right, and we welcome suggestions. With total derestriction of broadcasting hours we shall be offering some new programmes, most of them fairly modest ones. Television from lunchtime onwards calls for a leisurely style, not the breakneck pace we too often have to affect in our limited evening hours. Our share of ITV time is limited too. For example we can do only one major documentary a month. Because we care about what’s wrong with this society and the world we used to concentrate them – perhaps a bit gloomily – on social issues. We still choose to be serious, but now we aim at more variety of subject matter and treatment. For example John Morgan and Jolyon Wimhurst have just made a quite extraordinary film about the cultural and political history of Munich, the Munich that the Games tourists will only glimpse. And we’ve nearly finished Queen of Hearts, the story of Eva Peron. Our series on the Second World War is taking shape, but it is too early to say much about it. It’s our biggest project yet, and we’re not halfway. Finis coronat opus. The new programme I am particularly pleased, with is Something to Say. So often in television I have been responsible for discussions cut off just when they became interesting, and angry with myself afterwards. What I have always wanted to do was a programme in which just two people debated one subject for as long as they liked. Now we have it. 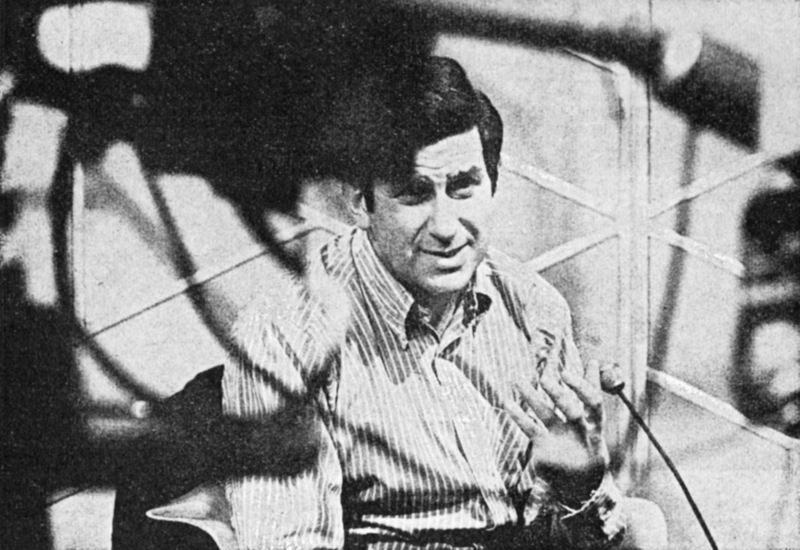 Jeremy Isaacs (born 1932) worked for Granada, Rediffusion, the BBC and Thames before becoming the first chief executive of Channel Four in 1982.